What does it actually mean when we talk about a BPA Free Coffee Maker? One thing that I will not do is to talk about BPA itself and what it can cause because there are tons of websites out there that can answer you this questions way better than me, for example, this post from the Mayo Clinic. 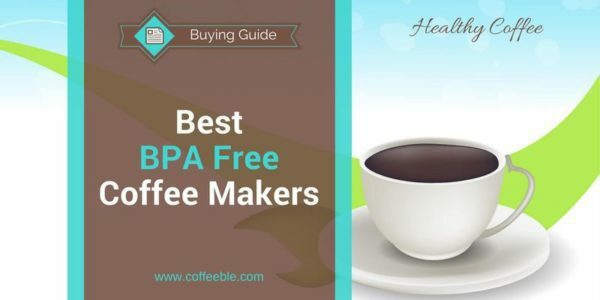 In this post, I will focus on how BPA is used in coffee makers and also provide you a list with recommended coffee makers guaranteed to be BPA free and are therefore safe for your coffee enjoyments. BPA In Coffee Machines - Are Plastic Coffee Makers Really Save? Why is BPA used at all when there is such a controversy about its safety? In short, Bisphenol A or BPA is needed to harden plastic. In coffee makers, the inner parts like the water tank or the coffee filter basket are made of plastic. These parts are in direct contact with the end product: the coffee you drink. There is “some concern” about developmental and reproductive problems in infants and children exposed to BPA. You see they specifically referred to infants and children which is worrying enough for all the Moms and Dads. In the last years, there have been a lot of controversial discussions among the experts whether BPA is also dangerous for adults or not. The FDA has not, in any event, found any convincing evidence for Bisphenol A to be harmful to adults. Still, many coffee manufacturers have started to produce BPA free coffee makers. In my opinion, even when the FDA assures that BPA is not harmful I think it is better to be safe than sorry! And there are still not so eco-friendly coffee makers out there so your decision to search for a BPA free coffee maker is a very smart move! The facts about #BPA and what it means in #coffee makers! FAST, EASY FILLING. Rotating base lets you easily access the rear water reservoir with just a quick twist. PROGRAMMABLE CLOCK. Set it up the night before with the programmable clock and pour yourself a hot cup first thing in the morning. ADJUSTABLE BREWING OPTIONS. Choose from 1-4 cups, bold and regular. SWING-OUT BREW BASKET WITH RELEASE BUTTON. With the touch of a button, the brew basket releases from the front for easy filling of your favorite grounds. MESS-FREE SERVING. Automatic pause and serve lets you grab a cup during the brewing process without any overflow. Plus, the mess-free pouring spout and nonstick warming plate make for easy, clean serving. 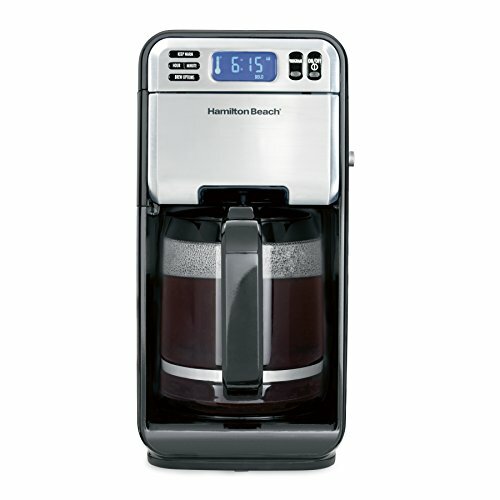 The Hamilton Beach 46205 is a great and reliable drip coffee maker with a lot of extra features. Programming is one of the features. You can prepare everything at night and wake up with freshly brewed coffee. Whether you want stronger or milder coffee is also an available option to choose from. The inner parts are indeed made of plastic, but Hamilton Beach confirms that all parts in contact with the beans are 100% BPA free. 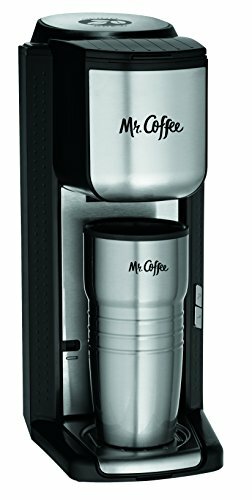 The Mr. Coffee Single Cup Coffee Maker is confirmed to be free of any BPA plastic. Inside the Coffee Machine is a blade grinder so you can brew freshly ground coffee at any time. But if you got a package of ground coffee for your latest birthday, this is also possible. Need a caffeine shot in the morning but are always in a rush? No time for coffee at the breakfast table? Well, then the Mr. Coffee SCGB200 is the perfect coffee maker for you. Just place your "To-Go" Coffee Mug under the brew dispenser and let it drip. 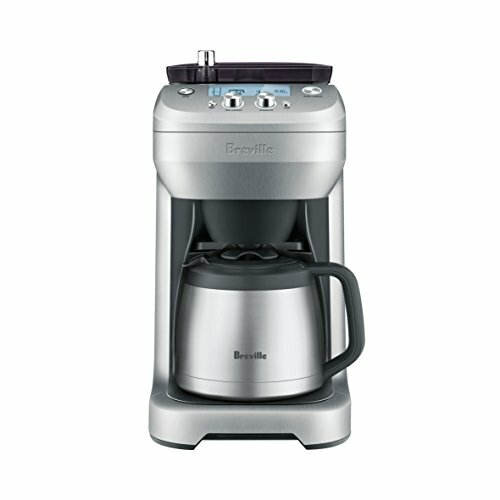 This massive Breville drip coffee maker with built in burr grinder is 100% BPA free. This fact is really important because there are a lot of plastic parts inside this coffee machine. One of the parts I'm talking about is the 1/2 pound of bean hopper, that holds your coffee beans. While it's been reported that the highest possibility of leaching BPA into food is when something is being heated, it's still calming to know that Breville's bean hopper is not leaching any Bisphenol A into your coffee beans. I can confirm that all of the DGB-models of Cuisinart are BPA free coffee maker! And since I have a more detailed post about this Cuisinart and other coffee makers with grinder, I don't think it's necessary to repeat myself here. If you are completely against plastic in coffee makers whether it’s the possible aftertaste or the health concern with BPA, there are some coffee makers out there that are 100% or almost 100% made without plastic. Please be aware of the possibility that some parts that are not in contact with the water or coffee beans could still be made of plastic, like the handle. I have looked around and think I have found a few excellent options for you to feel 100% safe with these BPA free coffee maker. Most French Presses are made of glass. But some exterior parts and the plunger could be made of plastic. Often, those plastic parts are BPA free but if you want to avoid plastic alltogether, choose a stainless steel or ceramic french press. 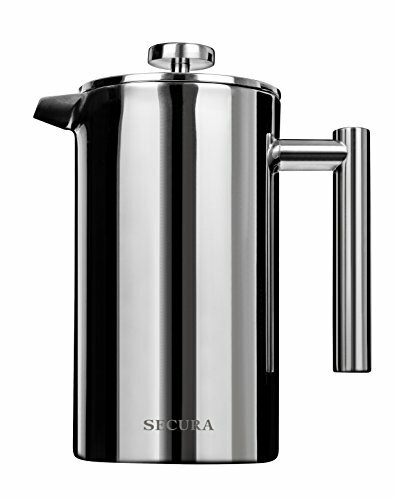 The best BPA Free Stainless Steel French Press is in my opinion the Bodum Columbia Press Pot which you can check more detailed above. In the list below I have added two more recommended Coffee Presses: one stainless steel from Secura and a ceramic Press from Le Creuset. I made sure that all parts, including the inner plungers and filters are all plastic free! Percolators have gained more popularity in home kitchens again. 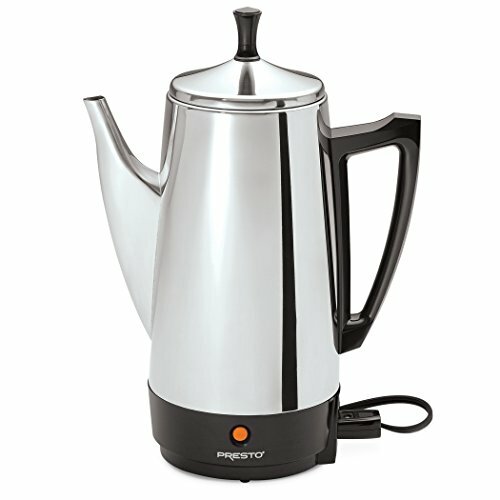 Especially BPA free percolators, since most of them are made of stainless steel. The only plastic parts may be the seal or handle. The P﻿﻿r﻿﻿esto 02811 is one of the most popular ones and I can surely recommend it. Although all parts that come in contact with water are plastic free, it is not 100% stainless steel. The perk well of the Presto 02811 is made of aluminum. Presto also confirmed, their Peroclator is 100% BPA free! Moka Pots produce very strong, authentic coffee almost like espresso in just a few minutes. Most of them are aluminum while some are made of stainless steel. 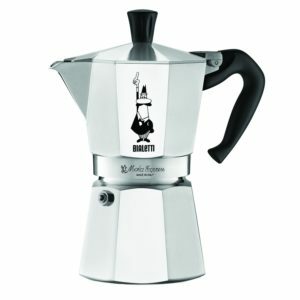 The Bialetti 6800 Moka Express 6-Cup Stovetop Espresso Maker is one of the most popular Moka Pots on the market. The unmistakeably octagon shaped pot is made of 100% BPA-free polished aluminum. Only the handle is made of plastic. Check BPA-Free Moka Pots At Amazon! The famous hourglass shaped beaker is 100% made of glass. 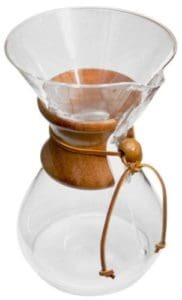 It is a manual coffee maker and you need special Chemex filters. But without any plastic, it is definitely a 100% BPA free coffee maker. I couldn’t resist adding this original Japanese ad for theHario V60! 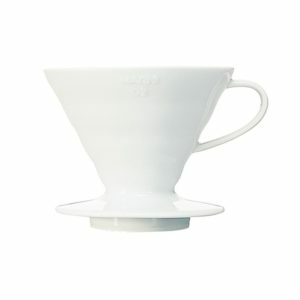 Most of them are made of plastic, but there are some made of glass or ceramic as for example the Hario VDC-02W V60 Ceramic Coffee Dripper – a fancy name for a simple filter cone by the way. They may not be as convenient as drip coffee makers because you have to pour the heated water manually over the grounds. But since you can influence the heat of the water and the speed of the pour you will get an unbelievable good cup of coffee – guaranteed! Check BPA Free Coffee Drippers At Amazon! If you want to be on the safe side choose a BPA-free coffee maker or one of the plastic-free coffee makers above. Feel free to contact me if you are not sure about if your favorite coffee maker is BPA-free. I will do the work for you! Tell me, do you know if you have a BPA free coffee maker? Please leave a comment below. On the search for a nontoxic BPA free coffee maker I also stumbled upon certain filter less brewing methods (French press and Moka pot) also contain a higher amount of cafestol a chemical that increases LDL (bad cholesterol). Which leads me to the conclusion nothing is ever 100% safe and will drive me batty. But anyway I am still trying to find the best and safest way for coffee production and consumption. Thank you for sharing your thoughts, Penny! Unfortunately, I have to agree with you that nothing is ever 100% safe. However, trying to find a BPA-free coffee maker is definitely a good start, isn’t it? I have heard of cafestol related to increased cholesterol levels, too but have not researched enough to form my own opinion about it. This is on my open points list :-). Don’t hesitate to ask more questions here or contact me directly in case you need help finding the safest products. Hey Thomas, thanks for all this. We bought a Delonghi espresso maker to save money on going out to coffee shops – De’Longhi ECP3420 15″ Bar Pump Espresso and Cappuccino Machine. However since it arrived and I’ve noticed the plastic pieces used, specifically inside the steamer and the spout inside the portafilter body. I can’t see inside the machine to see if there are other plastic pieces of concern, but these two that I mentioned are a big concern to me since these plastics come in contact with high temperatures. I haven’t been able to figure out whether the plastics are bpa free. And this also brings up the question for me of just how much plastic is used in the big fancy espresso machines in coffee shops? What’s the safest thing when you love espresso but would also like to save money and stay healthy? I found a couple web stores that claim, the De’Longhi ECP3240 is BPA free! Yet, I could not find any clear statement from De’Longhi itself that confirms it. My recommendation would be to contact them directly with this question. If they don’t answer with “YES, it’s BPA free”, then it’s not. In other words, if they use a nice description how they follow standards, but don’t really use the words that it’s BPA free, well, then it’s probably not. Your second question is a hard one and I have to admit, I don’t really have a good answer for it. The commercial espresso machines are usually made with high-quality materials and should be safe. But I do not know them all and what machine your preferred coffee shop uses. The safest thing you can do and save money is to use an espresso machine that is clearly marked as BPA-Free, like the Breville espresso machines, or to ask the manufacturer directly. And don’t forget to check your travel mug, whether it is BPA free or not in case you drink it on-the-go :-). Courtney, I hope I could answer your questions and want to thank you for you comment. Please don’t hesitate to ask again, if you have more questions! “BPA FREE” means nothing…if it’s plastic it is still toxic. There is BPS, which is just as bad if not worse. BPA is simply the one substance everyone knew about it, so all the companies went “BPA FREE” as a selling point, but left all of the other toxins in there. This is in mainstream media such as Scientific American….etc….not just conspiracy nuts. Be careful out there…. Let me first kindly disagree with you. BPA FREE indeed means something, namely it’s not containing BPA. And BPA is known to be toxic and can cause damage to the body. However, and now I have to agree with you, this is only one step of many. Only because it states, it’s BPA free, does not mean, it’s toxic free. Unfortunately, the rules say, as long as a chemical is not proven to be dangerous, it can be legally used. So, John, I want to share your warning and strongly advise everybody to be vigilant! Thanks again John for your comment! Hello, I am also avoiding plastic parts that come into contact with the hot water, as well as unfiltered coffee high in cafestol. Are there any reasonably priced coffee makers out there with a metal filter and no plastic that comes in contact with heated water? I guess you mean a metal water tank. Metal filters, like gold tone filters can be used for almost all drip coffee makers. But you put them in the filter basket, which is still plastic and also they let cafestol pass. Paper filters will block the cafestol. There are a few commercial coffee makers with metal water tank, I believe from Bunn, but they are expensive. Current price is $199, which is probably not ‘reasonable’, however, you get a lot for the money. The link above goes to my Brazen Plus review. I hope I could answer your question, Lisa! Thanks for this informative article. Last year I bought one from a local shop in London. But after started using the machine, my husband got admitted to hospital due to heart pain. Doctor said his heart is weak and there is a chance for heart attack. He found the reason behind his illness was the coffee machine. The inner parts like the water tank and the coffee filter basket was made of plastic. I too felt an odd plastic taste in the coffee. Guys, always buy such appliances from a trustable showroom and always choose good quality brands. Otherwise, it will cost a lot. Last month I bought one espresso machine from ‘Best brands appliances’, Canada. ( http://www.bestbrandappliance.ca/ ) An Electrolux 24-inch built-in stainless steel automatic espresso maker which has an LCD digital display and automatic self-cleaning before every brew cycle. wow, that’s a sad story but I hope your husband is better now. These built-in coffee makers at bestbrandappliance look great – hope yours lasts forever :-). Thanks for sharing your story, Janice. I need to buy a small coffee pot as I am the only one in the house that drinks it. I have a Kuerig but want rid of it for the reason you probably know. I bought a Mr. Coffee but have not opened it yet because I am trying to find out if it is BPA free. Can you help me? It is the 5Cup Coffee Maker by Mr. Coffee. Model TF7. I found a few websites online (walmart for example) which state that it’s BPA free. I want to make sure so I’m waiting for a confirmation of Mr. Coffee! I should get an answer soon. BVMC-ECX41CP CG series and CGX series, DRX5, PSTX series, BVMC-ECMP1000, and the SJX series. Thank you very much! I appreciate the help. Are there ANY single cup brewers without BPA? Can’t seem to find any. There should be plenty of single server brewers that are BPA free. If you have a specific model you like, let me know and I can see what I can find out for you. Or are you asking if there are plastic free single cup brewers? Because not every plastic coffee maker has BPA. Do you know if the Caprese 5 cup Coffee maker is BPA free? Can’t seem to find information. Do you mean the Capresso 5 cup minidrip coffee maker? Just check the product Q&A at the currently 2nd page. Unbelievable, that they still make any kind of products with BPA, isn’t it? Just goes to show that we must do our own research. Unfortunately, profit seems to be more important than human health. Thanks for your post. I want to confirm that Hamilton Beach or CuisineArt coffee drip makers are100% BPA free. I’m ready to purchase either one. What is your recommendation? Thank you! Both Hamilton Beach and Cuisinart have good and not so good coffee makers. Do you have any specific model in mind (both brands)? I was thinking Hamilton Beach 46201 the one you have listed. Changed my mind about Cuisine Art since I don’t need a grinder. I’m leaning towards the OXO Brain Barista 12 cup. It appears that it has less plastic parts which is my main concern. I’m also looking for one that has self clean or easier to clean. Thanks for your recommendations. The HB 46201 is a very popular entry-level model but nowhere near the quality of the OXO Barista Brain 12 Cup. But the OXO is also 5-6 times more expensive. If you’re OK with the price, go for the OXO Barista Brain. Are there any 1 cup bpa free coffee makers? Do you have a specific model in mind? I dont have any particular brand in mine. If there are any bpa free ones you could recommend I would appreciate it! Any single cup that you can recommend I would appreciate the info. I believe that all new Mr. Coffee and Cuisinart are BPA free. 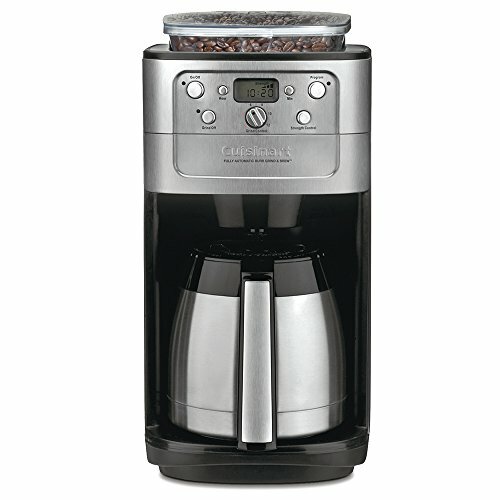 For example, the Mr. Coffee BVMC-SCGB200 is a single cup coffee maker with integrated grinder. Nespresso’s single cup espresso maker are all BPA free, too (again, the current models, I can’t guarantee for older ones). Cuisinart SS-5, SS-10 and SS-15 are BPA free as well. 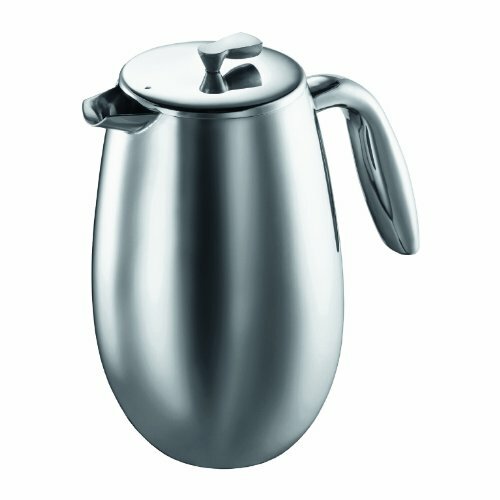 I noticed a lot of Cuisart coffee makers are plastic vs stainless steel. Should that be a concern or is it pretty safe if bpa free? whether we like it or not, most coffee makers are made of plastic nowadays. But plastic does not mean automatically BPA. Usually BPA is used in clear plastic to harden it. Although I’m not a big fan of “everything plastic”, I guess, I have accepted it. But I stay vigilant and try to avoid the real cheap no-name stuff. Old maker just died, so I pulled out a new Hamilton Beach 48463 Brewstation I’ve had lying around for a few years. This thing worries me in that it has no carafe, but instead uses a dark plastic insulated compartment to hold the coffee. So coffee sits for up to hours, as it would in a normal carafe, but in an all plastic receptacle, until you press a cup against it to dispense. On the bottom of the receptacle is a metal plate that transfers heat from an element beneath it. In other words, hot metal is in direct contact with the plastic it is mated to (with stainless screws, plastic washers, and some kind of gasket) in the bottom of the coffee storage receptacle, to be “kept warm” anywhere from 0 to 4 hours. Even using the “0” setting, the metal plate becomes quite warm while brewing. Maybe I’m answering my own question, but does the idea of this plastic heating, not to mention the fact that up to 12 cups of coffee stays at temperature for long periods of time in full contact with the all-plastic receptacle, seem like a generally bad idea? Or should I trust that HB wouldn’t knowingly produce a design (for many years) that could potentially be unsafe? Better safe than . . .? well, according to Hamilton Beach your 48463 is BPA free where liquid is in contact with plastic. But I hear you. I had the same machine, just the older model. At that time I didn’t really think about that plastic and hot coffee might not be a good combination. The coffee maker is likely safe but I still wouldn’t use it. I’m not a huge fan of coffee being kept hot through a heating plate. Depending on how long your coffee will sit in the tank, the last cups will just taste awful. So if you want to keep coffee hot over a longer time, keep it hot through insulation with a thermal carafe coffee maker (click on it to get to my post). Thanks for taking the time to share your thoughts, Bart! I’m having the same trouble of finding a plastic free (or near plastic free) drip coffeemaker; I don’t just want to avoid BPA as you said. You mentioned the OXO above but it doesn’t look like a traditional drip. 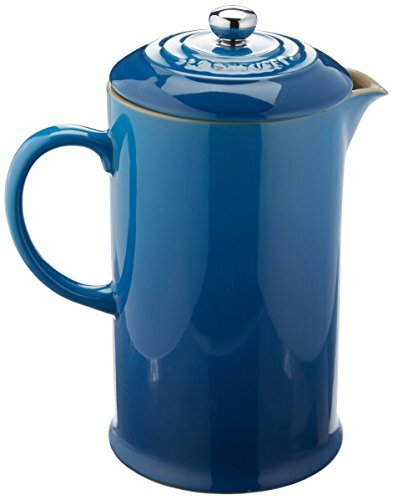 Do you know of any traditonal drip coffee, near plastic free, with metal filter (to save environmentally on paper filters)? But then people have mentioned needing paper filters to block out some chemical. Never heard of that. I need find out more. Would be so appreciative! Thank you for your expertise. I’m not 100% sure what you mean with traditional drip because the OXO is a traditional drip coffee maker just with a more modern design and few more features. “Near plastic free” and “drip coffee maker” is a hard to get combination. The Behmor Brazen for example has still a lot of plastic but a unique feature is the water tank which is metal, not plastic. Plastic free or almost plastic free coffee makers are usually manual coffee makers like French Presses or manual drippers. The other thing you asked about needing paper filter to block chemicals: I can only imagine they talk about Cafestol. Cafestol is present in unfiltered coffee (including permanent metal filters). I’m not a doctor but studies say that Cafestol may increase cholesterol levels and therefore it is considered for some to be a health issue. If you experience cholesterol issues please ask your doctor if he thinks it is of concern to you. If you have any more questions, Margaret, just reply. I’m more than happy to help. sorry in this case I couldn’t find any reliable source that tells me it’s BPA free. Since it’s the Walmart brand, I would recommend you to send customer support of Walmart an email. Is Braun coffee maker BK7000 BOA free? I assume you mean the Braun KF7000BK. Yes it is BPA free. You can find it on Braun’s homepage. Nice coffee maker by the way. Hope the coffee tastes as good as the machine looks like. I cannot guarantee but I found a manual very similar to your model and Cuisinart states that all materials that come in contact with water are BPA free. If you have the coffee maker already please check your manual. You should see the same. Braun BrewSense KF 7175 purchased from Bed Bath Beyond in 3/18. Neither coffeemaker, packaging or instructions say BPA free but Braun website and call to customer service say it is. A California Prop 65 notice was in the package. Customer service explanation for that was confusing. Yeah I know it’s sometimes confusing and I’m not sure if even all customer service representatives know what’s in their machines and what not. But the more calls they get the more I hope they are aware of their customer’s concerns.